The SoC3 is Fortinet’s 3rd generation System-on-a-Chip, custom designed by Fortinet (unlike other vendors) to accelerate the processing of security and networking functions in their firewalls. The SoC3 houses all inside a single chip, a CPU, a Content Processor (CP), and a Network Processor (NP). 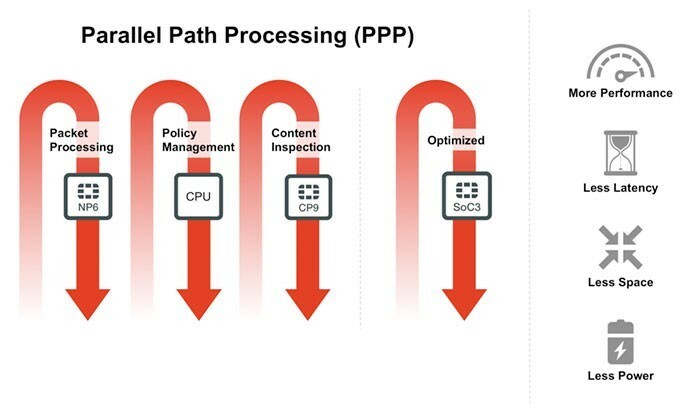 The point of this specialized hardware is to accelerate traffic and offload resource intensive processing (such as virus scanning, attack detection, or encryption/decryption) from the main processing resources of the CPU. You can find the SoC3 in smaller FortiGate models that are best suited for SMBs or enterprise branch offices, as models 200E and above will have dedicated (and often multiple) CPs and NPs. Many of VPLS Solutions’ customers are in the market for a FortiGate of this size. 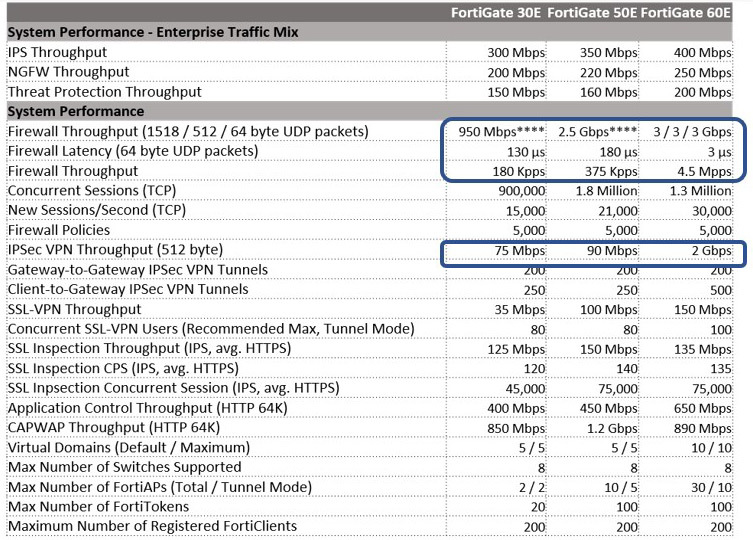 However, when comparing models, we like to point out that the lowest model sporting the SoC3 is the FortiGate 60E. Comparing the stats for the 30E, 50E, and 60E below, you will notice a drastic improvement in some of the numbers starting with the 60E, such as firewall latency and throughput. All of these improvements are due to the use of this SoC3 instead of just a CPU alone. With the price difference being marginal between these units, especially the 50E vs the 60E, our recommendation is to take advantage of the performance of the SoC3 and invest in the FortiGate 60E. Starting with FortiOS 5.6, all acceleration hardware has been renamed Security Processing Units (SPUs), and SPU usage is visible in a number of places in the GUI. For example, the Sessions dashboard widget shown below. If your organization is in need of renewing its Fortinet subscriptions, contact us. VPLS Solutions is a Platinum Fortinet partner, Fortinet’s highest partner status level, with numerous Fortinet certified personnel on staff. Additionally, VPLS Solutions has two Fortinet NSE 8 Engineers on staff. The NSE 8 is the highest Fortinet certification and VPLS Solutions is the first Fortinet partner to have an engineer with the NSE 8 certification. Let VPLS Solutions’ team of certified engineering professionals assist you with all of your FortiGuard Protection needs. For more information, please contact us. We look forward to partnering with you.